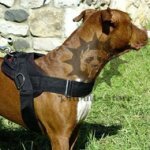 Which IPO Dog Harness for Staffy to Choose? 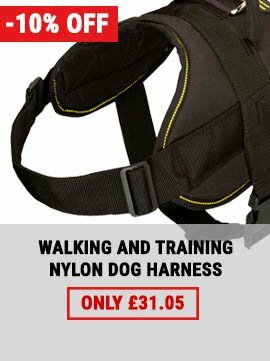 If you need a harness for IPO training, we have two the most suitable ones that are widely used and recommended by professionals. Learn detailed information about these harnesses and get the one you like best. 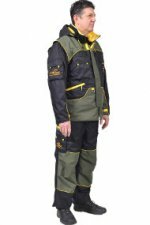 This IPO protection harness is perfect for any weather. It is made of nylon, which is highly-practical, stretch, tear and water-resistant. 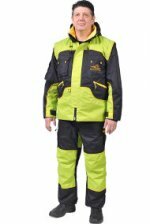 The harness won't disform if get wet or under heavy loads. 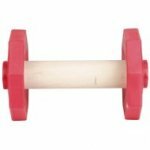 It is of light weight, but super durable. 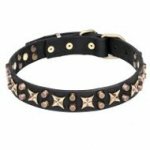 The harness is finely stitched for extra strength. 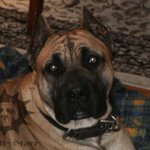 It is also harmless and dog-friendly. 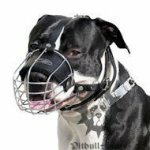 The dog won't feel uncomfortable being harnessed all the day long. 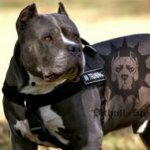 There is wide padded chest plate to provide exceptional comfort to Staffy and to protect its breast from shocks during training. 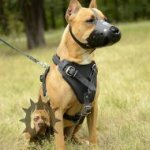 Back plate is also broad and is fitted with control handle and a D-ring to connect a leash. Two side D-rings serve for cargo attachment. 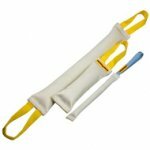 The harness can be used for muscles building and pulling as well. The rings are of nickel-plated steel. 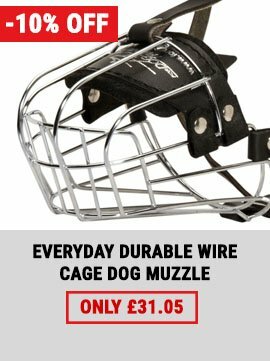 They are welded, break-resistant and rustless. 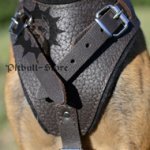 Adjustable straps serve for harness size regulation. 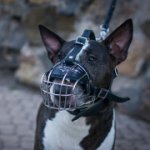 Quick-detach buckle of molded plastic is for easy Staffy harnessing. 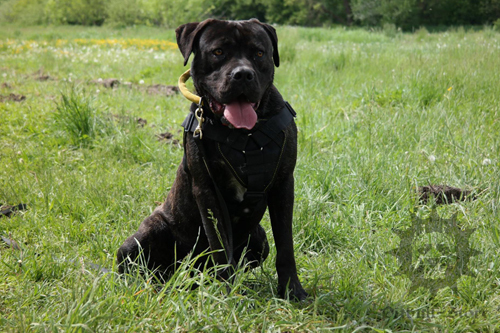 You can use this harness for other purposes, such as walking, training, sport, K9, police and service work. The other variant of IPO harness is of real leather. It is extremely strong, harmless and maximum comfortable. Leather is well processed, oiled and polished along the edges. 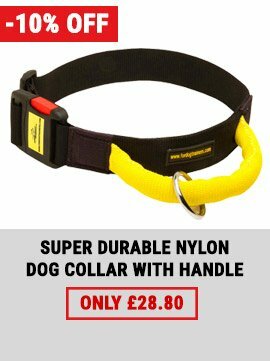 The harness is stitched for extra durability. 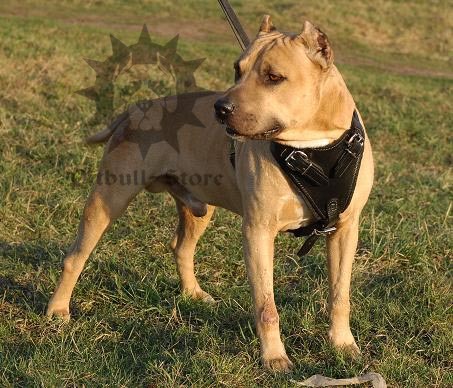 Large chest plate is lined with thick felt to prevent excessive loads and for Staffy breast protection. Back plate and front straps are felt padded too. 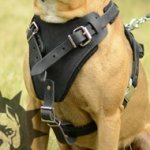 The straps are regulable to fit the harness to your dog's size perfectly. 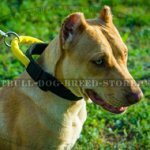 You will put the harness on your Staffy easily with quick-release buckle. Metal fittings of this harness are of nickel-plated steel. There are classic buckles to adjust the harness, easily detachable one and the D-ring for lead connection on the back plate. All the details are solid, rustproof and welded. There is an option of color (black or brown) and a handle choosing. 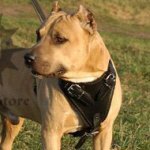 The harness is a functional gear and is used also for attack and agitation, various kinds of dog training, work and for everyday walking. Please, don't forget to take care of this harness with special leather balsam and it will always look like new!